It also looks like I went tanning this afternoon. I'm standing in front of the same wall in both pictures. I'm tanner than the before picture, but paler than the after picture. But I digress. We're talking about hair. The only reason I had long hair was because I enjoyed the novelty of pulling it out of its bun and having people go "Woah! You have so much hair!" but what's the point of that? I NEVER wore my hair down because it was scraggly, and took forever to style, and got caught on everything. NOW my hair is sassy! I don't look like a polygamist anymore! I'm very pleased. And I can't stop playing with it. Bahaha! 'I don't look like a polygamist anymore' Lol! Beautimus! I have never had long hair before I got married, but I figured what the heck. So now I have long hair, but soon it will be all chopped off. Lovely! I am now thinking of trimming my un-sassy polygamist hair too. Haha. You crack me up. Did you donate to Locks of Love by chance? I don't know what you're talking about. 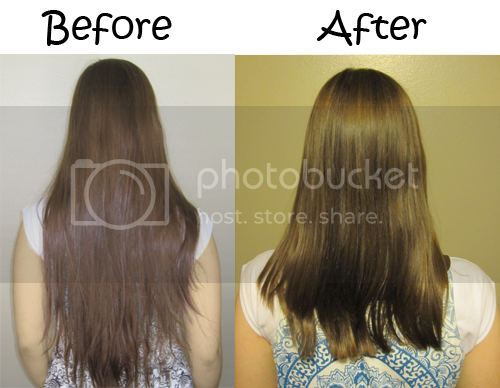 Your hair is the same length in these pictures. It's just your body that has grown. hehe. Seriously, awesome! I love the feeling, too, so I often grow mine out and chop off great lengths. My hair is actually a little bit longer than your before shot....I trim it myself every once in awhile to avoid the scraglies...I've been thinking of chopping a few inches off. It's so freaking long it's kind of ridiculous. Your polygamist comment made me lol! I had hair just like that, long and messy I had it cut to my shoulders but for some crazy reason it just grows back.